The world we live in keeps music makers on the move. Some days are spent in the studio, some on the road, and others dashing from gig to gig. If you program drums, make beats, or slice samples, it'd sure be nice to have a capable piece of gear that was travel friendly and studio ready. 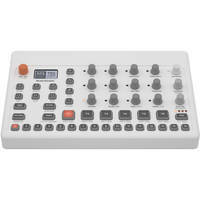 Enter the Model:Samples from Elektron! It's a sampler, six-track sequencer, controller, sound module, and more! Weighing just 1.8 pounds and measuring 10.5 x 7.0 x 1.5 inches, this compact groovebox fits nicely in a backpack or atop a table. The Model:Samples provides six tracks that can handle audio or MIDI, and each track features a sample playback engine, a resonant multimode filter, and an assignable LFO (low-frequency oscillator). On the audio side, it boasts 1GB of storage, including 300 preset sounds, courtesy of Splice.com. Out of the box, you'll have kicks, snares, hi-hats, strikes, and effects to push your tracks to new dimensions. Beyond that, the Model:Samples has 64MB of sample memory, and supports easy sample loading via its micro-USB port. Once a sound is in place, tweak it easily using the dedicated controls for sample start and length, pitch, decay, cutoff, resonance, and sends, which send to adjustable reverb and delay effects programs. If you opt for MIDI instead of audio, know that the sequencer on each track holds up to 64 steps, and grants real-time or grid-style recording (of notes and parameters) with simple quantization and swing. Execute your recording and note entries via six velocity-sensitive pads; MIDI data performed live or played back from the tracks can trigger an external drum machine or synth module via the 3.5mm TRS output and supplied 3.5mm to 5-pin MIDI adapter. Alternatively, use the adapter to route MIDI from a different controller/sequencer into the Model:Samples. Plug your favorite in-ear, on-ear, or over-ear headphones into the 1/4" stereo headphone socket, and use the balanced 1/4" main outputs to feed active monitors, an audio interface, or a mixer. Don't forget about that micro-USB port; it's perfect for hooking up to your computer! No computer? No problem! The Model:Samples allows 96 projects, each with up to 96 patterns; you'll age quite a bit before you fill those up. No matter your setup, no matter your locale, pick up the Model:Samples to start a new wave of audio waves. While you're at it, considering snagging the PL-4 protective lid and ECC-5 carry bag sleeve for safe and convenient transport! Visit the B&H SuperStore or see our website for more information!